The pink mustache. The fist bump. Riding up front and chatting with the driver. Those are all things that had come to define Lyft as a service over the earliest part of its journey, as it sought to win over users and position itself as an alternative to Uber and the existing taxi industry. As time has gone on, however, Lyft has become more lax with some of the traditions it was founded on, and is rethinking what users can expect when they use its app to catch a ride with one of its drivers. To understand the subtle shift in positioning, it’s probably best to look back and see how some of its defining characteristics came to be in the first place. Before launching Lyft, co-founders Logan Green and John Zimmer put a lot of thought into what they wanted the service to ride-sharing service to be like. Zimmer was a graduate of Cornell’s hospitality school, and he hoped to model the user experience on what you might expect from a boutique hotel: it could be quirky, sure, but it would also be friendly and inviting. Each ride would have its own uniqueness about it, just as no two rooms at a Joie de Vivre hotel would be decorated in the same way. However, even though the Lyft team knew each driver (and car) would have its own unique personality, it hoped to instill some common threads throughout the experience. The other big quirk was the giant pink carstache, which drivers attached to the front of their cars, and would overwhelmingly become the symbol of the service. Following through on this motto, however, carried with it a certain set of expectations for Lyft passengers — mainly that they would sit up front and chat with the driver throughout the ride, just as they would with one of their friends. In its earliest days the Lyft team spent a lot of time selecting and training its drivers with all of this in mind. From the time the service initially launched in San Francisco and even up until it entered its second market, Los Angeles, drivers were individually screened before being added to the platform. For a while, co-founders Zimmer and Green even interviewed potential drivers themselves. At launch, Lyft did all this partly out of necessity. After all, unlike the taxi industry, there was no standardization around the make or model that one of its peer-to-peer drivers would drive up in. Having a big pink mustache on the grill was an easy way to help passengers identify the car that was picking them up. Moreover, as the first peer-to-peer ride-sharing service, Lyft had to get users comfortable with the idea of riding with a stranger, and one who wasn’t commercially licensed to drive people around town. Lyft did a lot of work early on to ensure it did all the necessary driver and criminal background checks required, and as above, screened applicants for friendliness and personality before signing them up for its service. Still, it had to win over customer trust to get them comfortable with the ride-share model. While a certain amount of trust and safety was already expected and built in to the taxi industry and to the licensed black car drivers that Uber partnered with at the time, Lyft was using regular people and their cars to power its local transportation service. Positioning a driver as “Your friend with a car” was one way to help instill trust on the customer side of things, and to differentiate itself as an alternative to the silent or sometimes surly taxi drivers passengers had been used to. Things change over time, however. As the service matures, the same features that helped Lyft win over its earliest customers two years ago aren’t as useful in the current competitive environment. Again, some of the shift was born of necessity. After all, it’s difficult to scale community when your supply of drivers is constrained. Lyft first saw this about six months into its journey, as demand outstripped supply in San Francisco and it needed to rethink how it was onboarding drivers. The company could no longer afford to have its founders individually interview each to ensure they fit its personality. Over time, as it’s sought to keep up with demand, the individuality of its drivers is no longer quite as much of a focus. While the “Disco Lyft” and “Karaoke Lyft” vehicles are great when you see them, fewer and fewer drivers are putting in that much effort to provide a differentiated service. Moreover, it’s becoming clear that drivers themselves are a commodity, particularly as arch-rival Uber has aggressively sought to recruit away those who drive for Lyft across multiple markets. At the same time, there’s a bigger shift underway in passenger expectations. Increasingly passengers around the country are becoming comfortable with the idea of hailing a ride via mobile app, and the designation between a commercially licensed driver and one who isn’t licensed doesn’t matter quite so much to most. That is to say, the same education Lyft needed to provide to users two years ago isn’t quite as necessary in today’s environment. In the same way, it no longer needs a big pink mustache on the grill of its cars to make users aware of its service. And, finally, more education and awareness among consumers about available ride-sharing services means there’s less actual differentiation between them. Increasingly, users aren’t choosing a Lyft or an Uber based on friendliness of feature set, but based on price and availability. He who isn’t surge pricing and he who has the nearest car available frequently wins. As a result of all of the above trends, it’s becoming more and more difficult for Lyft to differentiate based on the same founding principles and “user experience” its co-founders dreamed up before launching the service two years ago. Even if Lyft could scale culture and extend it to thousands of drivers across hundreds of cities, it’s unlikely that consumers would care very much. All of which is why you’re probably seeing a subtle shift away from the Lyft features which used to define it. Lyft has stopped distributing the iconic giant pink carstache to all new drivers as it seeks to find more sustainable and effective methods of branding. The company first began transitioning away from the large mustaches in July — as it launched service in New York City — and now provides an emblem for drivers to put in their windshield to identify their cars as Lyft vehicles. They also provide a smaller version of the ‘stache, which Lyft calls the “cuddlestache” and is less cumbersome to place on the dashboard. A source within Lyft tells me the company is working on new visual branding to reflect its identity and that the “cuddlestache” is merely a short-term placeholder. It’s not clear when the replacement for the mustache will appear, but it’s likely sometime early next year. At the same time Lyft is moving away from the mustache, it’s also signaling a shift in passenger expectations. Last week, the company sent an email entitled “The Insider’s Guide To Lyft” which sought to explain some “Family Secrets” to users. While Lyft’s focus on community and friendliness was a key differentiator early on, there’s evidence that as it seeks new users, those same values might not be helping it. Anecdotally speaking, I know multiple people who refused to use the service because they didn’t want to sit up front or have a conversation with their driver — they merely wanted a quiet ride and to respond to email in silence while going to or from work, for instance. As Lyft seeks to grow and compete with Uber, the company realizes it’s going to need those passengers, too. 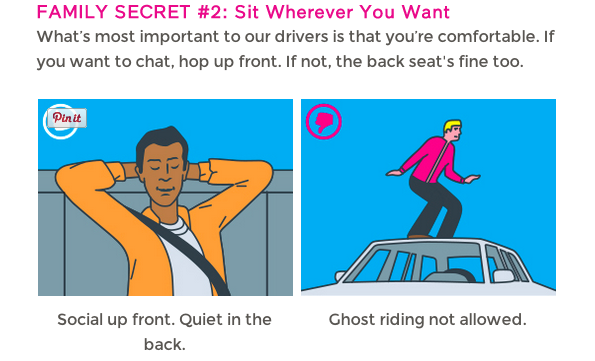 The “Insider’s Guide To Lyft” seems a tacit acknowledgement of that fact. But for many users, the differences between the two are becoming increasingly blurred. And as Lyft seeks to go mainstream, it seems the company is increasingly aware of that fact.